For those who enjoy sending special cards to friends and family and for admirers of paper jewelry, I have something unique to introduce today. Christiane and Oliver Hampel contacted me to see if I might like to review their new - and I mean brand new! - line of keepsake Jewelry Greetings. I looked forward to seeing the cards in person and was not disappointed... they are beautiful quality - felt-textured Strathmore Grandee paper with gold lettering and blank interior for personalization. 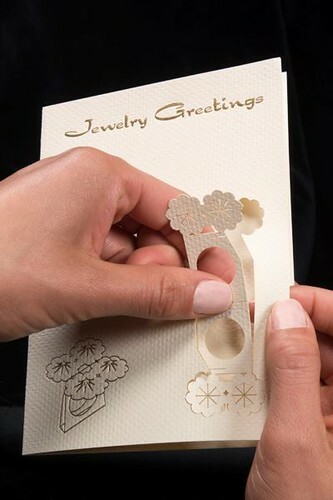 Each card features a sturdy, punch-out ring that is easily assembled and fun to wear - just right to send to a friend as a birthday greeting, thank you, or just because. The contemporary designs include Dancing Hearts, Bunchberry, Cherry Blossoms, Sunflower, Cattleya Orchid, and Trillium Lily. Of course the rings are not meant for everyday use, but will hold up quite well if worn occasionally. The ring is detached from the card front along perforated lines and assembled as shown on the included instruction card. Oliver, a graphic designer, and Christiane, a goldsmith, were born in Germany where they studied design and jewelry making; they now reside in Naples, Florida. 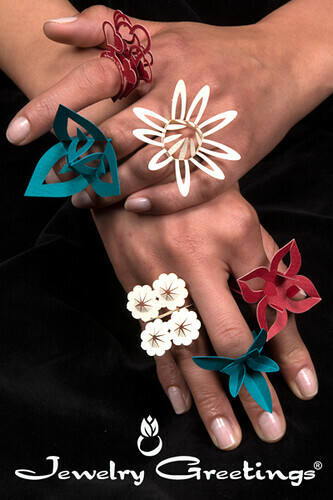 Looking for a novel way to promote Christiane's jewelry line, she and Oliver collaborated on the nature-inspired card set. 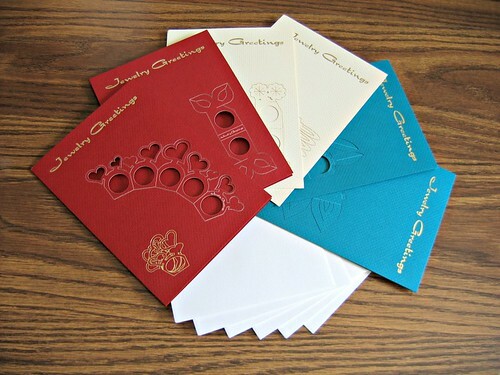 After receiving positive feedback from friends and family, they were encouraged to release the creative cards as a collection in its own right. Visit Jewelry Greetings which is also on Facebook. A Kickstarter campaign is underway too. These are amazing. 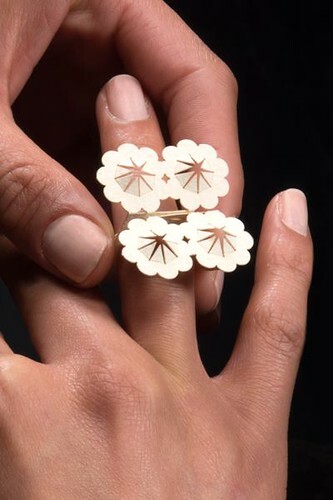 The ivory with gold card makes an elegant ring. The paper sounds rich. Very innovative idea, wishing them the best. Something I would definitely purchase. Certainly is different! A bit too big and gaudy for my taste though. I wonder how sturdy they are. Being paper, would it tear easily, get bent out of shape if bumped? Hi dragonswing, the rings aren't meant to be anything more than a novelty. If they get bent, the 80 lb. 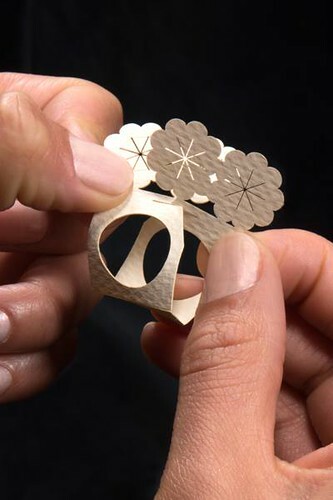 paper can be pressed back into shape pretty easily. That said, they are simply greeting cards with a little something extra. beautiful ideas, thanks you for sharing!! Just when you think every idea has been thought of, this comes along! What fun. I am excited about your card ideas. It would be so much fun crafting. Would love to add them on my Pinterest board. Despite the numerous digital cards, I may say I am still a fan of handmade Christmas cards . God bless you in all you do!